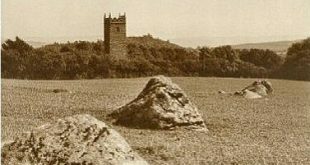 On the brow of Hand Hill which overlooks Nun’s Cross and Fox Tor Mires is a large triangular boulder upon which jauntily sits what has become known as “The Smallest Cross on Dartmoor”. In very recent times is seems to have become very popular both on the web and in blogs. It is another of those Dartmoor oddities that you seem to have to visit whenever in the area, if anything just to make sure it’s still there. After a recent stroll up to Eylesbarrow I dropped down to Crane Lake and then passed up to Hand Hill for another visit and sure enough there was the little cross – all was well with the world. On the way back down to Nun’s Cross I met a couple who asked if I knew where Hand Hill cross was and the thing I had never realised before was that how prominent the boulder was on the far off horizon. I pointed out the rock and parted company with the couple, as it was lunchtime I sat down by the Devonport Leat for my pasty and watched their progress. They literally walked all the way up the hillside, found the cross, examined in for a few seconds and then began walking back so there must be some fascination there. Anyway, the small, metallic cross is either called Northmore’s Cross or the Hand Hill Cross, the latter name comes from the fact that it’s situated on Hand Hill (although there is no mention of it on the OS map) and the former name from the fact that its a memorial for the Northmore family. The cross measures 10.6 cm tall, this is the length of cross showing above the rock and its fixing, it’s 1.6cm wide and has an arms span of 3.9cm so when compared with the other crosses it can be considered as small. The cross first appeared in 1982 and tradition has it that the cross was put there by some apprentices from Plymouth to act as a memorial to a member of the Northmore family or at least that’s one theory. “If you should happen upon this tiny object think on the 70 odd years I have been privileged to ride and ramble over that which I have come to regard as my very own. It is made from the propeller shaft of an old ship which probably sailed many thousands of miles, what a beautiful spot for a final resting place, don’t you think“. “I do not know who erected this cross but suspect that it commemorates some recently deceased person whose ashes may have been scattered nearby. This may be regarded as harmless as far as it goes but it would be a pity if this practice were to proliferate“. Ever since the appearance of the cross there have been numerous letterboxes which use it as a subject, at one time there were a good half a dozen boxes sited close to it. Granted I was not armed with any clues but on my last visit a few days ago I could find only one current letterbox. At one time there were two smaller crosses made from nails that sat upon the flanks of Skir Hill, these to the best of my knowledge have now gone thus leaving Northmore’s and Traveller’s Ford crosses. Now, here’s some sad news for Northmore’s Cross, having measured it and the small cross at Traveller’s Ford I can confirm that lengthwise the latter cross is 3.3 cm shorter and so the title of ‘The Smallest Cross on Dartmoor’ cannot be applied to Northmore’s Cross – it goes to the Traveller’s Ford Cross. However, having been lost and then replaced Travellers’ Ford cross has gone missing. Northmore’s Cross had suffer the same fate as the Traveller’s Ford Cross and was also stolen. Thankfully a while back the original has now been replaced by a new version which sits on the rock, as to who sited it nobody seems to know? This new one is slightly larger than its predecessor as it stands at 11 cm and has an arm span of 8.75 cm. Harrison, B. 2002 Dartmoor Stone Crosses, Halsgrove Publishing, Tiverton. Starkey, F. H. 1989 Dartmoor Crosses, F. H. Starkey, Exeter.